Coldstones Quarry situated on Greenhow Hill is one of the highest quarries in England. 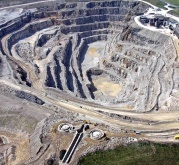 Despite its huge size, the quarry is hidden from view by its location and by a protective earth bund. 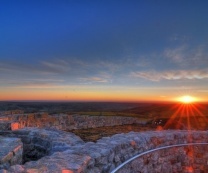 In 2006, following changes to the quarry boundaries, it was decided to replace a simple existing viewing platform with something more lasting and to provide a significant piece of public art which could add to the appeal and to the educational benefits of the site. 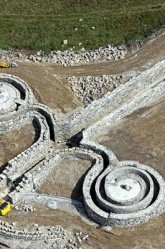 Nidderdale visual arts, a local voluntary arts group, together with Hanson Aggregates which operates the quarry, offered a design commission to Andrew Sabin. You can read how Andrew developed his design concept for the sculpture and the elements which influenced his thinking. The design process took 3 years, requiring artistic and technical assessment about the site and construction methods. There was also a lengthy public consultation about the proposals which demonstrated large public support. The partners in the project including Harrogate Borough Council and The Nidderdale Plus Partnership developed the proposals; planning permission and funding were obtained in late 2009. Construction commenced on site in March 2010 and the sculpture was officially opened by Dr. Penelope Curtis, Director of Tate Britain on 16th September 2010.